What are your thoughts? Will you be backing this on Kickstarter or purchasing one in the future? I think it looks awesome, but am a little worried about the storage capabilities...doesn't look like a very large central pocket. I also wonder how unevenly heavy the bag will act when it is in "tote" form - ski boots ain't light! Hey! This is James, founder of Switch. The central compartment is surprisingly big, and fits all your ski gear and more easily. 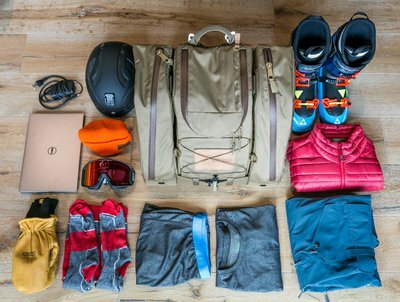 I have been traveling with prototypes for over a year now, and you can put everything you would need for a weekend ski trip in that main pocket. Everything in this photo fit with more than enough room to add a change of clothes or two, and there are interior sleeves for laptops/tablets up to 13" on both sides. As far as weight goes, I have some of the heaviest boots imaginable--the curse of a size 14 us foot. We designed the strap placement to distribute the weight as evenly as possible, and many people I've shown the bag too actually think the tote is the most comfortably way to carry! Thanks for the post, and let me know if you have any more questions. Wow,haven't seen such a good looking kickstarter in quite a while. Definitely going to go far,good luck! Already pre-ordered mine! Love supporting up and coming ski brands, and the bag looks amazing. Only 15 hours left to reserve a bag! There will be extremely limited quantities released to the public next season, so back on Kickstarter right now to make sure you get the best boot bag ever made.